For Hair Salons, Spas, Beauty Parlors, Hair Care Product Exporters, Suppliers & Manufacturers. People are very sensitive with dealing their dry/ damp hairs and want to do anything to keep their hair healthy and manageable. Forasmuch sales of cosmetic or hair care products are booming day by day it is a golden opportunity for you to bring your hair caring products online. 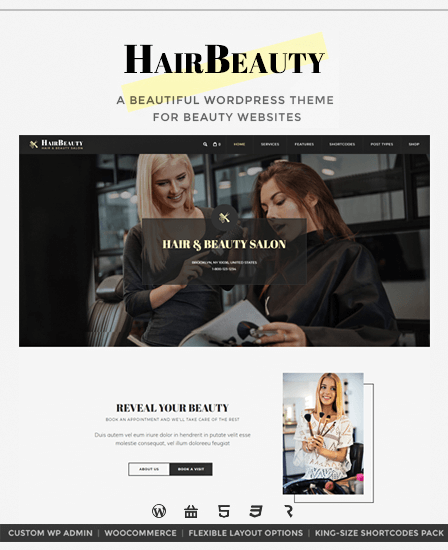 So we are introducing a modern and stylish theme that allows you to create an E-commerce website where you can showcase the latest hair care and styling products in a professional manner. 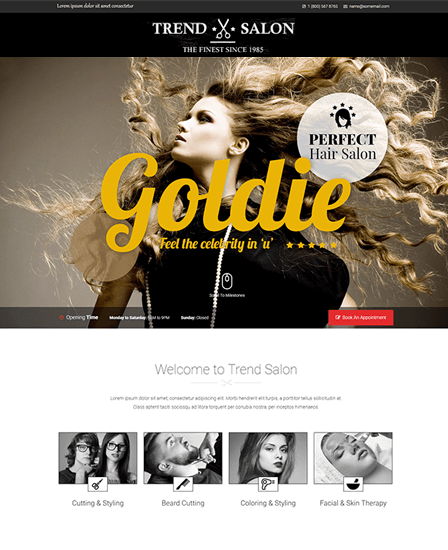 HairStar WordPress theme is carefully designed for hair salons, beauty parlours, spas, hair care product manufacturers, suppliers, exporters and anyone who are in the beauty industries. Let’s check amazing features of the theme. Selling hair care product online is essential for having a beauty industrial website that permits buyers to take control of buying any product from your site. 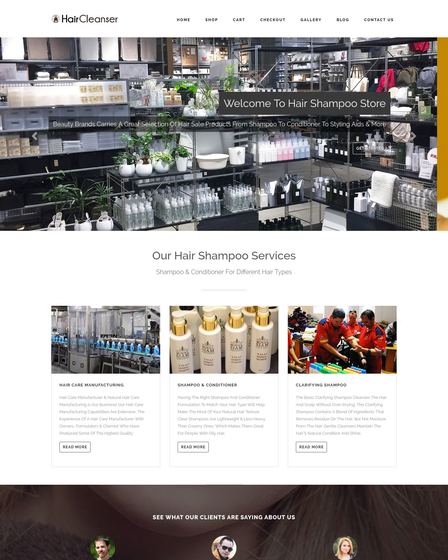 So HairStar WP theme is integrated with WooCommerce plugin that allows you to create E-commerce website for your beauty industry. Also, the theme is built on Twitter Bootstrap framework that gives your site visitors a dizzy browsing performance on any device. A shopping cart is ingrained with the theme that permits visitors to add multiple items to the cart. It plays a vital role in giving marvellous browsing experience. A dedicated button for your visitors to redirect them to the payment page where they can see the full essence of their order. And a PayPal payment gateway barrier allows you to collect payment online. 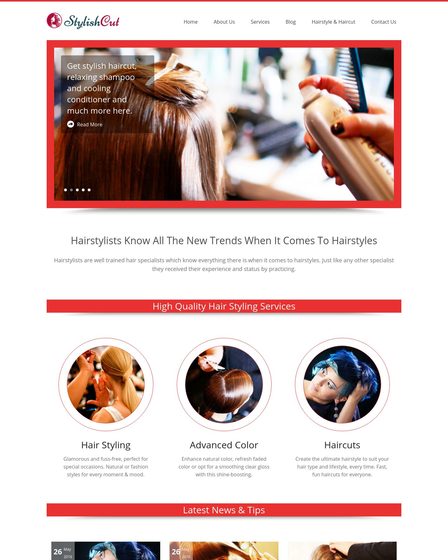 HairStar WP homepage has unique features, one of it is product section where you can showcase your newly launched product. It gives a professional look on your site. HairStar theme is packed with so many interesting features that deliver enterprises level quality for creating an E-commerce website. The slider of the theme has two layouts boxed and fullwidth. You can choose any one layout as you want. You can also display the multiple views of your store in the form of an image. 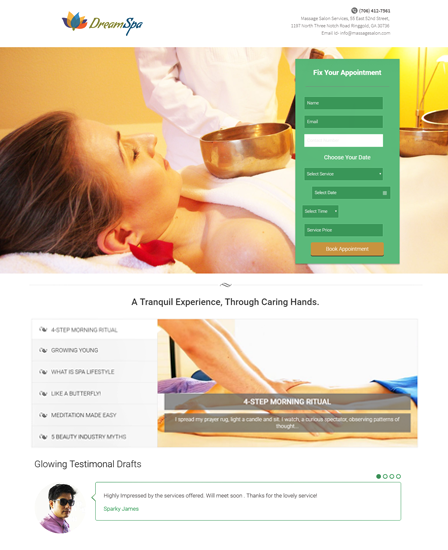 The theme has a separate testimonial page with parallax background effect to display your client’s feedback. Also, the theme has a unique blog layout that renders you to create a portfolio. Your recent blog posts will be displayed on the homepage in a cool and beautiful manner. You can share some useful tips via the blog like how to manage hair easily, use conditioner after shampoo, put some oil on hair before taking shower, etc. It creates a virtual community among the people.